Graveyard of Mopars. 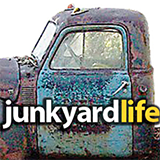 Bubba, a collector of hundreds of cars from the 1930s-1970s, invited Junkyard Life on a tour of his place in Mississippi. We jumped at the chance because we wanted to see if he did indeed have 600 cars. Yes, he does! And we were also amazed to find dozens of Mopar muscle cars. 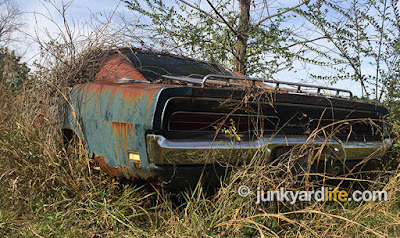 Bubba owns some of the finest, restored cars you will ever see – all covered and protected from the elements, but we were more interested in the field of dreams behind his garage. We wanted to see the rusty junk. Let’s go! Plymouth Barracudas, GTXs, and Road Runners. Dodge Chargers, Challengers, and Coronets. All with their fair share of patina. 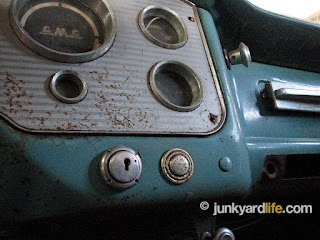 Toss in a few vintage Jeep CJs, a Travco and this was a fantastic trip. We trudged through and over briars, and barb wire to gander at the hundreds of would-be dream cars and trucks. Some may think Bubba is plum crazy for leaving these cars outside but he has been collecting them for many years. Bubba bought them when they were dirt cheap and/or on their way to the crusher after being wrecked. This man knows his cars and has saved many from certain demise. Bubba has no intentions of selling what he has worked hard collecting, so don’t ask. We thank him for keeping our junkyard dreams alive! More from our adventure to follow soon. Ron Kidd goes nuts over Bubba’s Dodge Chargers. We found a real 1964 Impala 409 wagon in the field. Introducing the 1956 GMC Suburban Carrier! This truck is rare beyond the likes of our travels. We have never seen one. The Suburban Carrier was produced from 1955 until 1959. 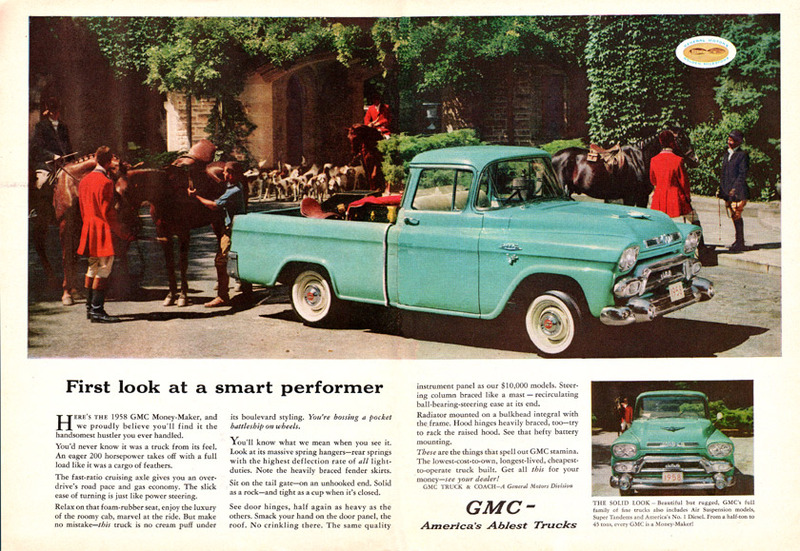 These classy trucks lived in the shadow of the pop culture icon we know as the Chevrolet Cameo. The idea behind the Cameo and Suburban Carrier was to wreck the stigma attached to trucks of the era. 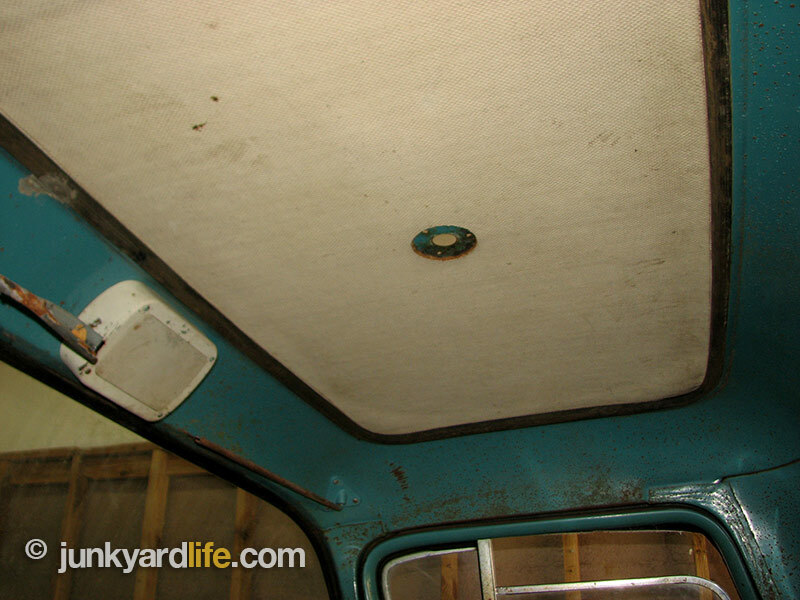 The center section of the ’56 GMC’s rear bumper opens to allow spare tire to slide under the bed. The consumer market demanded trucks. They really needed them. Every industry from farming to manufacturing had one prerequisite in common — We need a truck. Thus, the stigma was born. 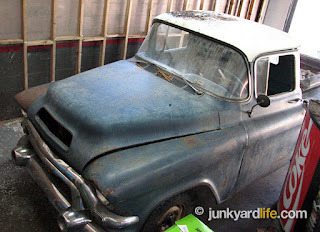 This is what Pontiac guys with deep pockets could do for a truck in the mid-fifties. Was this luxury truck ahead of its time? Or was the market just not ready for the sticker shock they would receive if FredTruckBuyer were to stumble upon one on the dealer’s lot? Chances are that FredTruckBuyer would not even see one, because production total for the entire model run was only around one-thousand units. This truck carried a higher sticker price, thus making the target audience a bit thinner. What did you get for the money? Class will tell and in this case, you bought a very top shelf appropriate vehicle. These trucks usually made their way to affluent owners with an image to maintain. 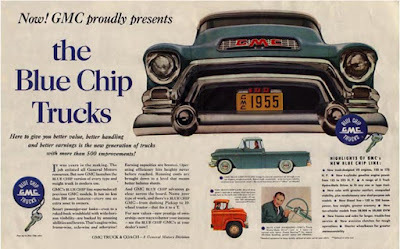 GMC had an image to maintain as well. So, did they make their luxury appointed truck into a manicured, pansy hauler? No. 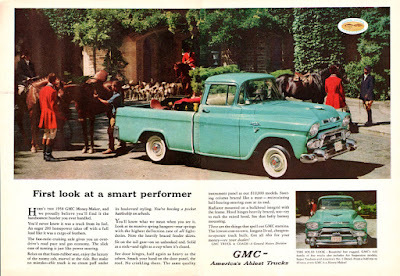 We learned from this awesome 1956 example that GMC gave us more than we ever expected. 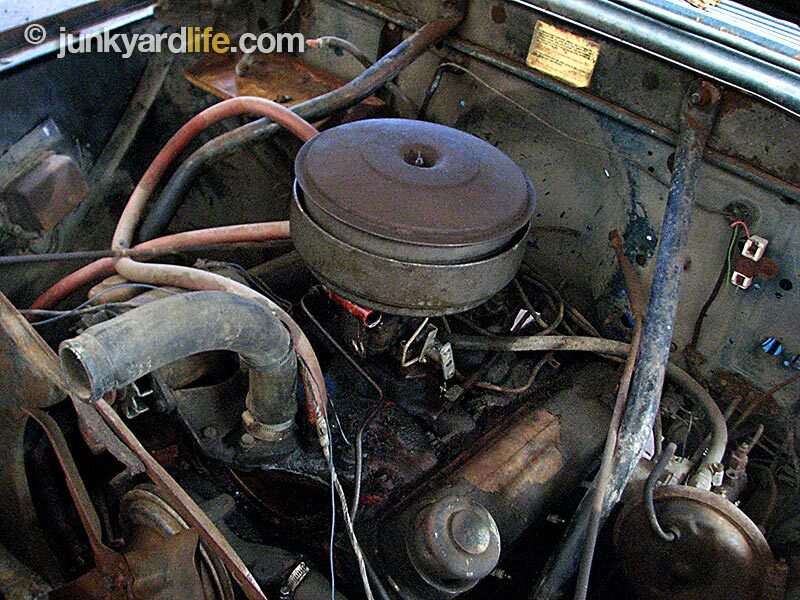 Big torque flowed from the Pontiac engine to get the truck-worthy job done. A 317-cubic-inch Pontiac-V8 powered 1956 GMC Carriers. Chevy’s Cameo cousin offered up a 265-V8 Chevrolet. So, right from the start, GMC offered a larger engine. If that was not enough, George Jetson here had a 4-speed automatic transmission. Big deal? Yes. Four-speed autos were everywhere thirty-years later. But, a four-gear automatic in a world of 2-speed Powerglide automatics and manual 3-speeds was unheard of in 1956. Very much before it’s time but still truck-minded. A super low, granny gear gave the GMC stump pulling power as part of the 4-speed auto set-up. Check out the indicator below and the odd patterns. How much is that part worth? Also notice the extra bracing from the firewall. Steady as she goes! Unique gear selector for a 1956 GMC Suburban Carrier pick-up. More leafs than Fall in Connecticut under here. Also, note the six lug heavy duty drums. The ’56 GMC Carrier has the brute hauling and pulling power of Paul Bunyan’s oxen and the class of Cinderella. 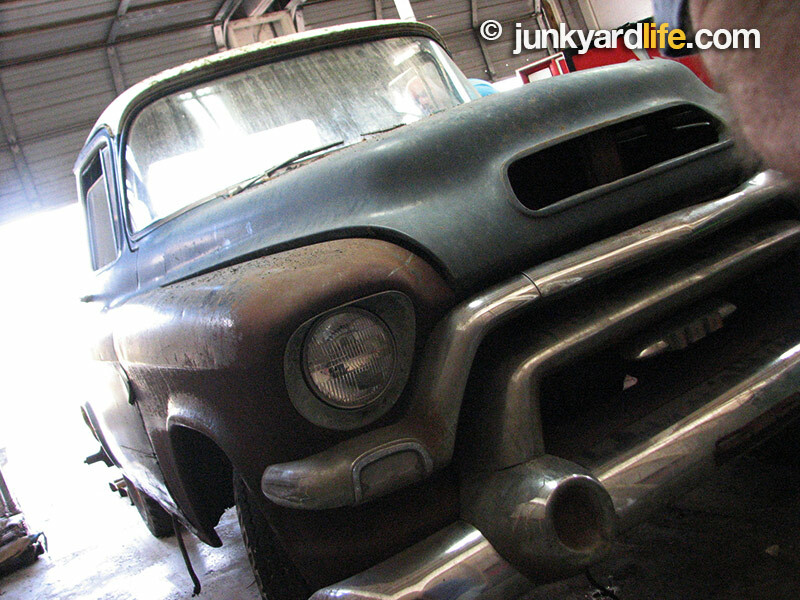 The owner of the truck plans on restoring the ’56 GMC Carrier to its former glory. It was purchased as you see it now. Rob Herring, of north Alabama, plans to restore this 1956 Suburban Carrier he found in Georgia. According to a windshield sticker, it also spent some time in Illinois. Herring said he found a strange coal or ore substance in the crevices that led him to believe the truck spent some time around a mining community. Perhaps a supervisor in a very successful endeavor would be assigned such a truck. We liken that to a foreman today being assigned a Cadillac Escalade instead of a Colorado or an S-10. We also noticed this fancy pants had a headliner! That wasn’t common in 1950’s trucks. How cool. However, this one had a provision that made us wonder if it may have been equipped with a light bar. That would further substantiate our “supervisor” theory. Also, is that a two way radio or intercom speaker? They were quite serious about inspection stickers on the 1956 GMC Suburban Carrier. The truck was certainly a beauty. We could not find a cowl tag with the trim codes. This would have been super interesting because of the strange color combination. 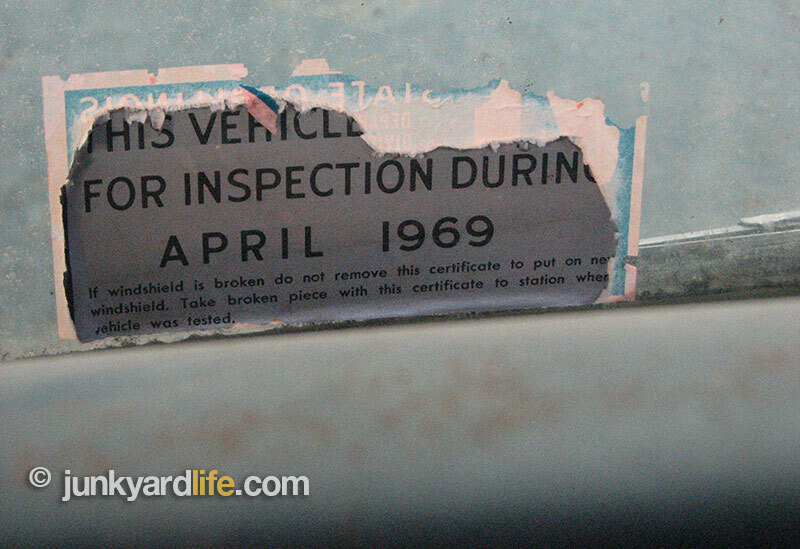 The literature from the time indicates two colors usually used together on GMC Carrier trucks. We found a darker blue color on the exterior with a white roof for a two-tone effect. Well, the interior is clearly the Aqua color. Three-tone? It appears to be factory. We looked behind the cab and other places Junkyard Life detectives process a crime scene for a re-paint. It all appeared factory. See the Aqua interior color? Also, note the very regal steering wheel. Junkyard Life loves cool steering wheels. We must because we mention them often. So, even with this truck’s mysterious history and several unanswered questions, we confirmed the myth of the Pontiac-powered pick-up truck. Okay, we already knew it existed and we know you probably did too. We just have never seen one and this is very exciting. 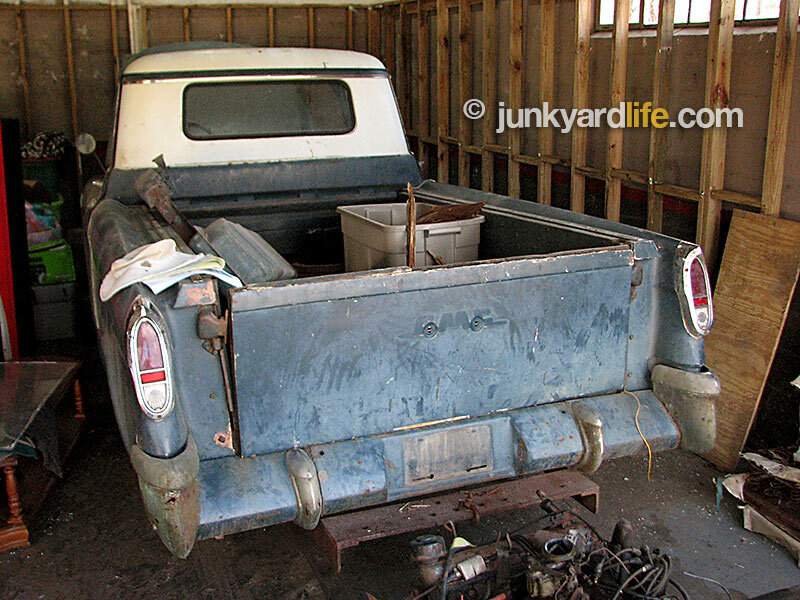 So, maybe Junkyard Life’s Pontiac-powered truck ideas are not that far fetched after all! The owner of this truck purchased an old filling station in Alabama and discovered that it used to be an old Texaco station. He uncovered a wall of the original Texaco green and white ceramic tile. We were hoping the truck was discovered in the old gas station. That would have been super cool. 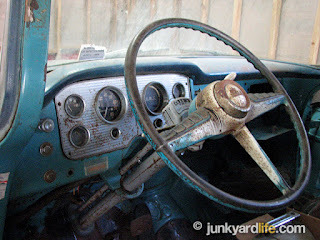 This truck, and other trucks of the era, had a provision in the floorboard to add brake fluid. That’s right. If you needed brake fluid, and your cab was carpeted, make sure you could peel it back. The GMC Suburban Carrier is not so well known because it lived in the shadow of its famous, highly-collectible cousin, the Chevrolet Cameo. The name “Suburban” is the longest continual use nameplate. Chevrolet produced the first Suburban for the 1935 model year. This classy truck could pick up anything except Ron’s grandmother; She would have refused to acknowledge the culture barriers this truck overcame and still not have been picked up by this pickup. 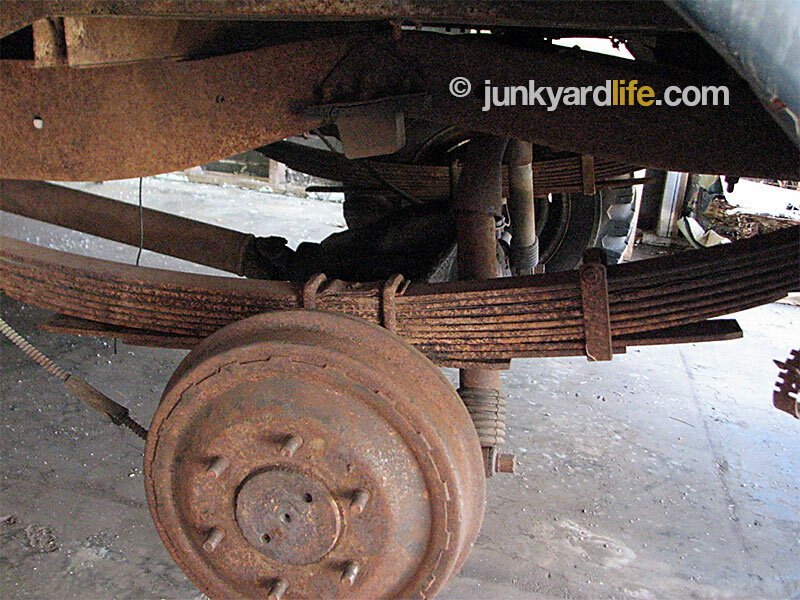 Even though the focus was on style and luxurious trim appointments, this truck was rather heavy duty with enormous leaf springs and extra bracing. 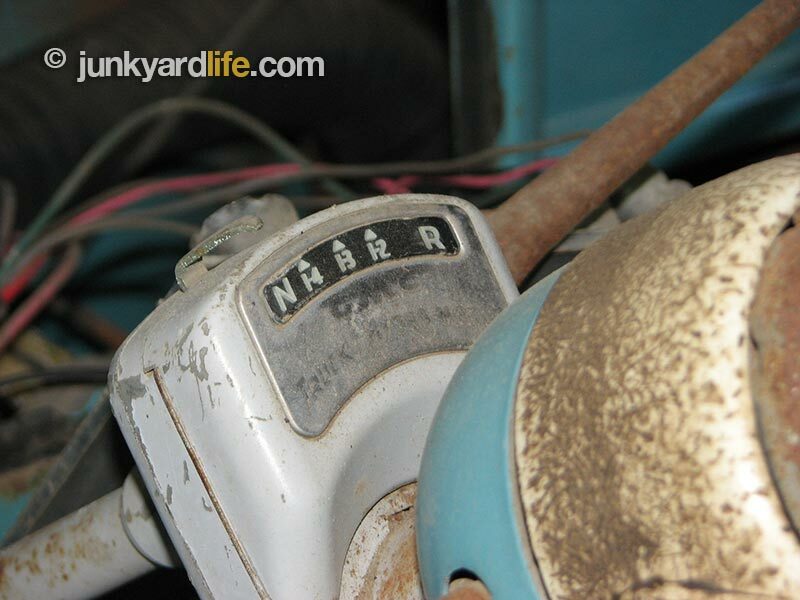 Not finding a cowl tag was compensated by an interior tag telling us the horsepower and torque numbers. 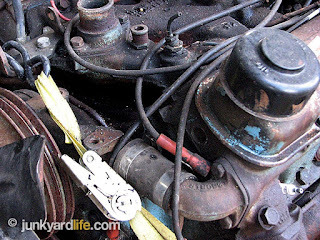 The early Pontiac V8s had a strange housing that went from the water pump directly into the driver’s side cylinder head. These trucks had a cover that attached to the bottom under the bed so that the spare tire could not be seen. The rear bumper had a unique design that allowed the center section to open up and the spare tire would slide in, much like a big glove compartment — if your gloves were round rubber tires that said “Goodyear” on the side. Painted steel dash with lots of hard parts on the 1956 GMC Suburban Carrier. Water pump pushed water directly into the front of the head. Fancy pants headliner in the 1956 GMC Carrier. Luxury items were rarely found in trucks of the 1950s. Not another pretty face. 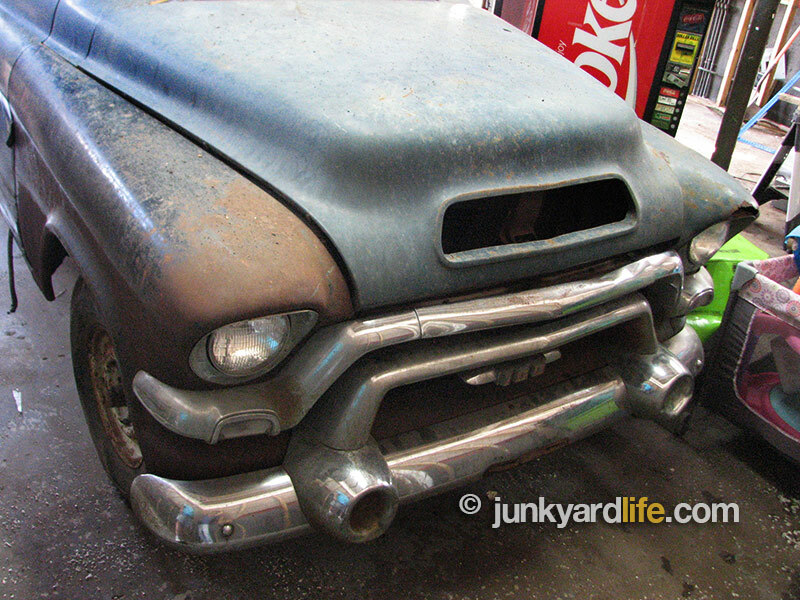 1956 GMC trucks were tough looking, almost ugly. Some still run to a Chevy or Ford for less intimidating looks.